Different banks offer different kinds of investment products and options. Long-term investors look for security in their investments. This security normally comes in the form of investment vehicles that provide safety of their capital and assured periodical returns from the investment. In this light, Fixed Deposit rates and schemes have always been an attractive option for the safe investors looking to park his/her money for a fixed term with assured periodic returns. Banks and Non Banking Financial Companies offer different types of Fixed Deposit rates and schemes that you can choose from depending on your investment goals. Standard or Regular Fixed Deposits rates: These schemes are normally offered for fixed tenures ranging from 1 to 7 years. Generally, in these kinds of schemes, the longer the term the higher the interest earned. 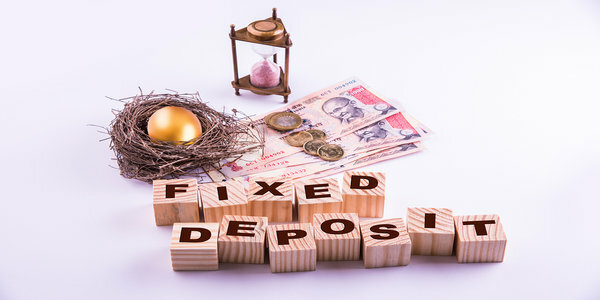 Special Fixed Deposits rates: These Fixed Deposits if left untouched for a certain term, earn higher interest than what would be earned in a Standard Fixed Deposit scheme. Tax Saver Fixed Deposits rates: These are long-term Fixed Deposits where your money is locked in for a period of five years. The principal amount invested in tax saver Fixed Deposits are exempt from taxation with an upper limit of Rs.1.5 lakhs per Fixed Deposit. Tax deductions under Section 80C are applicable for this kind of Fixed Deposit. Regular Income Fixed Deposits rates: If you as an investor are dependent on regular income from Fixed Deposits for your monthly expenses, then this type of Fixed Deposit is your best bet. Here you have the option to have the interest paid out either monthly or quarterly depending on your needs. This type of Fixed Deposit rate is best suited for retired persons. Cumulative Fixed Deposits rates: If you are an investor who is not dependent on your Fixed Investment Returns, then cumulative Fixed Deposits are worth considering as an investment option. In Cumulative Fixed Deposits, the interest if not withdrawn, is invested back in to the scheme and the next interest cycle will have the said amount added to it. Flexi Fixed Deposits rates: These Fixed Deposits are linked to savings accounts. So, if you have a savings account in a particular bank you can invest in a Fixed Deposit in the same bank and link it back to your Savings Account. In this way you can create a Fixed Deposit and link it back to your savings account. Banks also give you the option to put a cap on your savings amount and any excess amount in your account will be transferred back to your Fixed Deposit. Corporate and other Fixed Deposits rates: These kinds of Fixed Deposits and Fixed Deposit rates normally offer a High Rate of Interest and generally the term of such deposits is 3 years. Non-cumulative Fixed Deposits: Non- Cumulative Fixed Deposit schemes offer various patterns of interest withdrawal option such as monthly, quarterly, half-yearly and annual with differences in the percentage of interest given. Basically, the more often you withdraw the lower your interest earned will be. What are the common features of Fixed Deposits? From the above we can see that Fixed Deposits and Fixed Deposit rates are traditionally viewed as safe investment avenues for the safe investor who is looking for fixed returns with minimal risk of capital loss. In a fixed deposit your money is locked in for a fixed term and you get a fixed, pre determined reward from your investment. Generally speaking, Fixed Deposits are a safe investment option and Public Sector banks are normally known to give the more popular Fixed Deposit options and schemes. Fixed Deposits are a safe investment choice for senior citizens and retired person who cannot afford to risk their capital investment and require a conservative and assured return from their investment. A safe way to save your money and earn interest on it with minimum risk involved. The capital invested can easily be withdrawn. Easy loan and over draft facilities available on certain types of Fixed Deposit schemes. Great benefits for senior citizens and retired persons. The common disadvantages of investing in Fixed Deposits. Fixed Deposits rates do not provide for inflationary changes or market changes that could favorably affect your investment rate. So you may miss out in this respect. The Tax rates charged on Fixed Deposit earnings are generally high, except for Tax Savings Fixed Deposit schemes that are for a longer fixed terms of 5 years. In Fixed Deposits, the Fixed Deposit rates may fall due to premature withdrawal of Fixed Deposits. Fixed Deposit rates are fixed and lower as compared to other investment options. As they say, risk is proportional reward. Now that we are clear on the basics let us look at the kind of interest rates that are offered on Fixed Deposit investments. Normally, fixed deposit rates offered by banks are given for tenures ranging from as short as seven days to as long as 10 years. Some banks offer Fixed Deposit Schemes that can stretch up to 20 years. Let us look at the Fixed Deposit Interest Rates given by the top Ten Banks as on November 2016. As mentioned earlier in this blog/article, Fixed Deposits are a popular investment option for those looking for fixed returns from safe investments. The pros of investing in Fixed Deposits make it a popular investment option for Senior Citizens and retired persons. If you want to calculate the interest rate you will earn from your Fixed Deposit you can use the following calculation method to arrive at the same. There is a simple way in which Fixed Deposit interest rates can be calculated using an interest calculator. 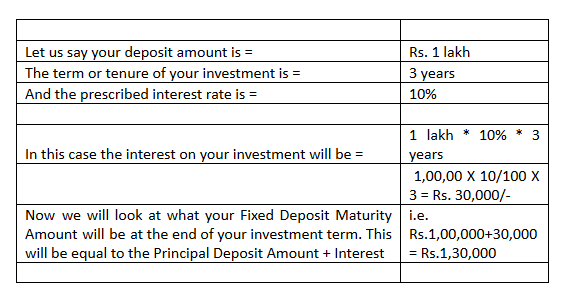 Below is an illustration of how Fixed Deposit interest rates can be calculated using an interest calculator and simple formula. 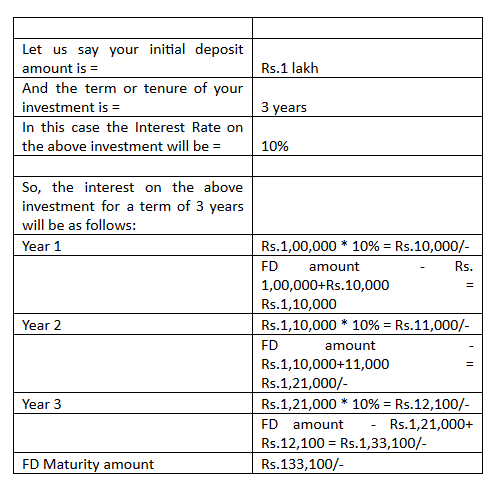 How to calculate Simple Interest on your Fixed Deposit investment? Now we will look at how to arrive at the Compounded Interest on your Fixed Deposit Investment. Now that we have understood how to calculate the interest on your Fixed Deposit it may be easier for you as a well-informed investor to navigate your way through the sea of Fixed Deposit options. One more thing to keep in mind while making your Fixed Deposit investment choice is that there are certain situations wherein your interest rates on Fixed Deposit Rates may vary, such as, when there are any changes in Reserve Bank Policies such that affect the Cash Reserve Rate, or the Reserve Bank of India makes changes in the Repo rates that may happen from time to time. Another variable that could affect your Fixed Deposit rates is varying inflation and recession rates that affect the purchasing power of money. And lastly, economic conditions that affect the savings requirements in the economy. These are some of the factors that can affect the value of the interest earned from your Fixed Deposits that may vary your Fixed Deposit Interest rates. It is wise to keep these points in mind while making your fixed deposit investments. Now, before you go haring off to the banks to make your Fixed Deposit investments, it is advisable that you go through the below list where we have put together all the documents you will require when making a Fixed Deposit investment. Address Proof in the form of a Passport or Adhar Card or any other valid document. A valid proof of identity in the form of a Passport or any other official document. In case you have a nominee you will need his/her address and identity proof. A copy of your and your nominees PAN Card. If you cannot provide your PAN card a higher rate of tax will be charged on your interest earned. Some banks require an introduction letter from an account holder if the depositor does not have an account with the bank. We at Monexo believe that the wise investor is one who keeps learning and changing with the times. To sum it all keep you can just go through the below bullets at your convenience to understand in a nut shell all you need to know or keep in mind when making an investment in a Fixed Deposit scheme. Every Bank has a different rate of return and offer different Fixed Deposit rates so you can take your time and choose one that suits you and your needs best. To avoid higher tax rates you could divide the total sum of your investment into various Fixed Deposits. Interest Pay outs on Fixed Deposits can be annual, half yearly or quarterly. Depending on the term of your Fixed Deposit investment your interest amount may vary. In general, higher the tenure will give higher interest and vice versa. If you withdraw your deposit amount prematurely you may face a withdrawal penalty. Some banks offer loans or over draft facilities on Fixed Deposit investments. This is often when the Fixed Deposit is linked to a savings account in the same bank. You can earn simple or compounded interest on your investment depending on the scheme you opt for. The discussion – what is better for you - Fixed Deposit investments or peer to peer lending? So, the general consensus is that for the various reasons as listed above, fixed deposits are a safe investment option for investors. However, with changing times and technologies this trend is changing. People are always looking for newer and better ways to invest their money. With the surge in the fin tech industry in India, fueled by the changing stand of the government of India towards demonetization investors are suddenly open to a bouquet of unconventional investing options. Peer to peer lending is one such new choice available to investors. There are a multitude of reasons why peer to peer lending should be a part of your investment portfolio. In a sense peer to peer lending has a lot of commonality with Fixed Deposits, as bother modes of investing offer safety of capital invested, fixed periodic returns and fixed interest rates. As a leading peer-to-peer lender in India, we at Monexo find more and more investors getting drawn towards peer to peer lending as a lucrative and safe form of investing. We at Monexo.in find that investors normally look for high returns, flexible terms and safety when considering investment opportunities. In this regard, peer-to-peer lending is proving to be a chosen investment option in comparison to other investment options such as fixed income instruments as well as equity investments. Research finds that at present India is not too far behind in becoming a leader in peer to peer lending. The first and most important reason why you should consider peer-to-peer lending as an investment option is to add diversity to your portfolio. Yes Fixed Deposits have traditionally been a top choice for investors looking for fixed, periodic returns but peer to peer investing offers you the added advantage of flexibility in your investments. P2P lending offers you a lucrative portfolio diversification option that goes beyond traditional short term investment choices such as stocks or long term investments such as Fixed Deposits. P2P lending normally uses an online platform to bring borrowers and lenders together on an anonymous basis. P2P lending is safer than one would think, as the borrowers are always pre checked to ensure they meet certain specifications to make sure that they are safe to transact with and have a good credit history. If you are an investor who is wary of this kind of investing but still want to give it a shot you can start with an investment as low as Rs. 10,000/- and work your way up as you get more comfortable with the system and process of p2p lending. These features of P2P lending give a lot of flexibility to the picky investor looking for low risk and high reward. Yes, as mentioned earlier there can be such a thing as low risk and high returns, Normally, when one thinks of peer-to-peer lending we think of it through the shoes of the borrower as it offers a fast, easy and convenient way to borrow money from the market without any hassles. However, for investors, peer-to-peer lending is a good option too as it gives a consistently high return on investment. With a peer-to-peer loan investors can earn up to 30% per annum on investments. This is much higher than the interest earned on most traditional forms of investment including from Fixed Deposits. Data shows that peer-to-peer loans garner an average interest rate of 16% per annum. So when compared to savings bank accounts or fixed deposit earnings investors stand to gain almost 50% more from P2P lending. A prudent investor would not normally want to take big risks with their investments. This is especially true of retired or senior citizen investors who are completely reliant on their interest pay outs for meeting their monthly or annual expenses. With p2p investments, the biggest fear in the mind of the investor is the possibility of the borrower defaulting on the repayment of the loan. But this risk or fear like most fears, is more perceived than real. But we at MOnexo understand the mind of an investor and maje sure that our investors are absolutely comfortable when they invest their money with us. To mitigate any risk of loss of capital, there are systems in place to make p2p lending safe for the investor. In p2p lending, loans are only given to borrowers after thorough checks are carried out and it is proven beyond reasonable doubt that the borrowers have a good credit score and are sure to pay back the loan as contracted. All efforts are taken to keep the loan procedure efficient and easy, while at the same time keeping the chance of loan default to the minimum. 4. Regular Fixed Income and interest rates. In a p2p investment, the interest rate is fixed and so is the payment schedule for both the loan payback and the interest. The loan is normally repaid on a monthly cycle and so is the interest. This is convenient for investors as well as the borrowers. In this way investors can avail of high and quick returns on their investments through peer-to-peer lending without having to deal with waiting for quarterly lengthy interest payouts. This is one more reason why P2P lending is a good option for those looking for monthly payment of interest from their investment. Finally, if you want to go beyond the option of Fixed Deposit for investment need and are looking for a term investment to suit your convenience and investment schedule while at the same time offering a high fixed return, p2p lending is perfect for you. P2P investing makes the investor the boss. In P2P lending you get to set the terms of how much you want to invest and for how long. By doing so you are able choose how much interest you will get from your investment and gain more confidence in the P2P market place. Terms of p2p loans vary depending on each transaction and the individual preferences of the lender and the borrower, and this makes p2p lending a personalized and popular mode of money lending. The term of a peer-to-peer loan can range from a few months to a few years. This flexibility enables investors to time their investments in such a way as to suit their investment and liquidity needs. We hope that you find this blog helpful to you if you are on the look out to broaden your investment portfolio. After going through this detailed analysis of Peer to peer lending and Fixed Deposit investing you will find that there are many similarities between the two and you can definitely take a chance with p2p lending to gain more from this type of investing.